Asian lady beetles are invading my house, HELP! This is a frequent issue that people are starting to realize they have during winter months and in the spring. You may be wondering what you can do to get rid of them. First, you are seeing these insects because they have been winterizing in your home and now are trying to get back outside as it starts to warm up. In the spring, the only practical thing to do is remove them from your home by vacuuming. An economical method for vacuuming lady beetles is to use a knee high nylon stocking that has been inserted into the extension hose and secured with a rubber band. As you vacuum, the lady beetles are captured in the stocking. When the vacuum is turned off, remove the stocking so the captured beetles won't escape. The rubber band can be used to close the stocking which then can be thrown away or reused after the contents have been discarded. It is not going to benefit you to have your home treated at this point. MaxPro Pest Control does have a solution! Sign up below to have MaxPro Pest Control contact you in late summer/early fall to let you know the when the time is to have the exterior of your home treated to STOP the lady beetles from ever entering your home. The multicolored Asian lady beetle is generally about 1/3-inch long. Its appearance can range from orange to yellow to sometimes even black. They typically have 19 spots on them, but they can have fewer, and even none. Asian lady beetles feed on aphids not only in trees, but also those found in agricultural crops and gardens. They are important predator of soybean aphids, a serious pest in soybeans in the Midwest. 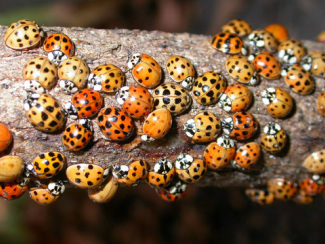 Large numbers of Asian lady beetles will congregate to buildings on the second day of temperatures that reach 65 degrees followed by freezing or near freezing temperatures. These conditions generally occur between late September and late October. Once they reach a building, they will enter through cracks and crevices around windows, doors, siding, and any other gaps they may find. I have these in my home, how do I get rid of them? Prevention is the most effective method to keep these insects out of your home. Lady beetles can fit through an opening as small as 1/8 inch. Make any repairs to seal these entry points to prevent these beetles from entering your home. This will not eliminate all Asian lady beetles, but it will greatly reduce the number. If you see these insects inside your home during the winter and spring, there is no effective way to remove them as they are in wall voids and other areas that are generally out of reach. Insecticides at that point are very ineffective and the best course of action is to get out the vacuum. We chemically treat the exterior of buildings with a residual insecticide before they enter your building. MaxPro Pest Control treats for these lady beetles in late September to early October. We prevent these insects by treating your home prior to the insects coming in. Please include where you are located and any additional questions or comments you would like us to contact you regarding.